There's plenty to do and see in the Highland Lakes area! From panoramic fields of bluebonnets and wildflowers, American Bald eagles soaring above Lake Buchanan to a shoot out in an old west town, a ride through the Hill Country on a steam train, or a relaxing tour through a vineyard, your days will be filled with lots of Texas fun! Enjoy the splendor of the Texas wildflowers. Take sceinc drives through the Lakes and Hills region. 512-756-1872 Representing old town of Burnet by staging a gunfight in the "Old West Town" near the train depot. Regularly scheduled performances at 2:30 p.m. on most Saturdays. Schedule is in accordance with the Hill Country Flyer train schedule. 830-693-1008 Award winning minature donkeys with names like George Jones, Garth Brooks, Dolly Parton and Reba McEntire! Open to the public - but please call first to make sure someone will be there to show you around. 512-715-0330 The footprint of the main grounds and buildings covers approximately four acres or 174,240 square feet. The main residence is nearly ninety feet tall. Hundreds of thousands of pounds of limestone, granite, sand, cement, rock and block, were used in the construction of Falkenstein Castle. Falkenstein Castle sits on 113 acres with a majestic 360-degree panoramic view of the Texas hill country. Public tours are not currently avaialble. 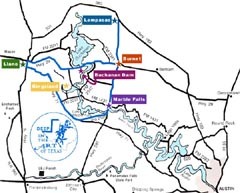 Tour the scenic Texas Hill Country by train! The Hill Country Flyer descends rugged Short Creek Canyon and crosses the tall trestle over the South San Gabriel River on its way from Cedar Park to Burnet. During a leisurely layover in Burnet, enjoy lunch and shopping on the town square. The train operates on an evening schedule in December for a beautiful view of holiday lights along the route. Pick your own fresh, sweet strawberries during the spring, blackberries and tomatoes slowly take over as summer arrives. While you're there, find your way through the giant "Texas" hayfield maze. Patty is a certified "step-on" guide available to bus and van tours who want to see the Hill Country, Austin, San Antonio, Fredericksburg, etc. Her knowledge and experience are extensive. 1-512-756-6986 Winter and early spring are dominated by some twenty-five American Bald Eagles that migrate to the Texas Colorado River Canyon for the winter. Dine on our traditional Mexican/American Fajita Buffet while viewing the awesome beauty of the Colorado River Canyon. Enjoy waterfalls, towering cliffs, abundant wildlife and the many scenic vistas along the river banks. Imagine your own isolated paradise and forget that any other world exists beyond this. The Highland Lakes region is home to a number of vineyards and wineries producing award winning Texas wines. Tours and wine tastings are a great way to spend a weekend in the beatiful Hill Country. Texas Wine Trail Make your destination the Hill Country during the five designated "Wine Trails" throughout the year. Each winery will be hosting special events including tastings of newly released wines, wine and food pairings, seminars, demonstrations and tours. Enjoy Hill Country artists, musicians, crafters, chefs and entertainers of all kinds.